The Energy Costs of Cooling and Heating a Home NPR's Climate Connections series with National Geographic has prompted a lot of questions from listeners. Several wanted to know how air conditioning compares in its energy consumption – and climate impact — to home heating. Each month, NPR's Climate Connections and National Geographic's Green Guide answer your consumer-related questions on climate change – explaining what you can do to make a difference. Does it matter if you travel by train or plane? What's the best way to water a lawn? Send us your questions about how your consumer habits have an effect on the environment. NPR's Climate Connections series with National Geographic has prompted a lot of questions from listeners. Several wanted to know how air conditioning compares in its energy consumption – and climate impact — to home heating. The answer, experts say, is that both heating and cooling your home take large amounts of energy, more than we use for any other appliance. But according to researchers at National Geographic's The Green Guide, you will probably consume more energy heating your home than cooling it. In colder states, heating can account for up to two-thirds of your annual energy bills, according to the U.S. Energy Information Administration (EIA). And, on average, heating an American home with natural gas produces about 6,400 pounds of carbon dioxide (CO2, a major warming gas). Use electricity, and CO2 emissions average about 4,700 pounds. In a cold state like Minnesota, the numbers jump to 8,000 pounds of CO2 for natural gas and 9,900 pounds for electric heat. In hot parts of the country, the calculation changes: Air conditioners become the bigger energy users. A typical centrally air conditioned home in Florida, for instance, produces about 6,600 pounds of CO2. 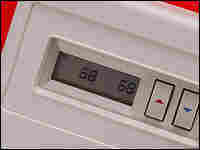 You can reduce emissions by adjusting your thermostat. If you have central air conditioning, for instance, for every degree above 72 F you set your thermostat, you save 120 pounds of CO2 emissions.